With its imposing Gothic Revival architecture and gorgeous perch overlooking the Hudson River, Lyndhurst Mansion in Tarrytown, NY is the dramatic backdrop for television shows, fashion and commercial shoots, and feature films—most recently, Showtime&apos;s "Seven Deadly Sins" starring Morgan Spurlock, and "A Winter&apos;s Tale," starring Colin Farrell and Jessica Brown-Findlay. It&apos;s old-world glamour in the heart of Westchester! Location managers are especially awed by Lyndhurst&apos;s priceless art, historical furniture, and stunning landscapes, says Christine Plazas, the estate&apos;s manager of event planning and sales. Plus, she adds, it&apos;s a National Trust for Historic Preservation site and is incredibly film-friendly. "What we offer to production companies is a whole team to support them," said Plazas, who has a background in hospitality management. We also work closely with crews so they can take advantage of all 12 buildings on our 67 acres, while protecting our collection at the same time. Our on-site curator is an invaluable asset, who recognizes that filming at Lyndhurst helps us preserve it for the future." 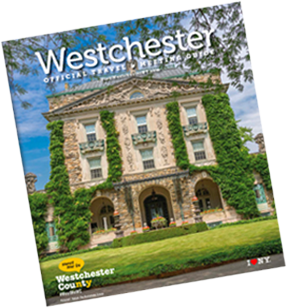 Now open to the public, Lyndhurst was originally built in 1838 as the home of William Paulding, Jr., who was the mayor of New York City in the 1820s. The home was later purchased by merchant George Merritt and eventually by the railroad tycoon Jay Gould. The staff at Lyndhurst can facilitate an array of productions and special requests, according to Plazas. "For A Winter&apos;s Tale, which was set in the 1840s, they needed snow," she recalls. "It happened to be a dry winter, so the production covered the entire lawn with white fabric, sprayed in ice, brought trees in covered with ice. We also worked with them to build a tent on the mansion&apos;s roof, which became the sleeping quarters for Jessica Brown-Findlay&apos;s character, who was sick with tuberculosis." During the shoot, Plazas recalled that they discovered that Colin Farrell was a classical musician. To relax in between takes, he gravitated to the concert grand Steinway piano once owned by Jay Gould. For the History Channel&apos;s "Men Who Built America," special outbuildings substituted for a New York City tenement, and the carriage house was used as a pub. In addition, the mansion, bowling alley, conservatory, and indoor pool building were featured. 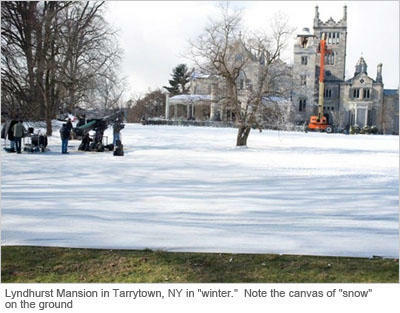 Many productions have built sets on site, and gone on to film at other locations nearby in Tarrytown and Westchester. The option to leave sets intact while filming in other places is possible at their location, says Plazas. "We also offer plenty of space for equipment, trucks and trailers, and cranes," she notes. Lyndhurst is also familiar in high fashion and digital arts circles. Hamptons Magazine, and Gotham Magazine are among the publications featuring shoots at Lyndhurst. Plus, the mansion has been featured on several episodes of TLC&apos;s "Four Weddings," including eight finales, and the exterior was filmed and used for the look and design of a video game. Among the wackier shoots at Lyndhurst? "Radio Shack filmed a battery commercial here," says Plazas. "We had a lot of little girls in pink Barbie cars driving around the property, which was a lot of fun!" For more information on filming at Lyndhurst, contact Christine Plazas, Manager Event Planning & Sales, at CPlazas@savingplaces.org.